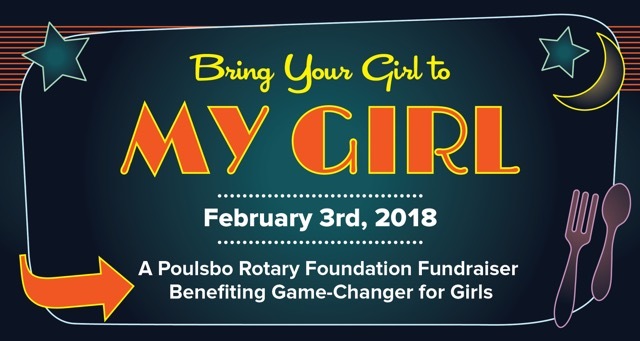 The Poulsbo North Kitsap Rotary Foundation is sponsoring a fundraiser called “Game-Changer for Girls” on behalf of Side by Side, a local charity fostering micro enterprise and jobs to benefit the education of girls in South Africa. The event will be held at My Girl Diner in Kingston, WA, on Saturday, February 3rd, 2018. My Girl, a replica of a '50s diner, is the perfect place for the event, which will be a fun 50’s theme evening. Attendees can dress up and participate in contests like bubble blowing, dancing the twist, or trying to use a hula hoop - or perhaps just dance to the rock and roll music and relax by the soda fountain. Side by Side, a Poulsbo based 501c3, has set up to produce and deliver reusable sanitation products in South Africa. Another US based organization, Days for Girls, already produces in the US and then delivers washable, re-usable sanitary hygiene products for girls in developing countries around the world. Side by Side is attempting through a project called "Game Changer" to establish a microenterprise in South Africa to produce in-country (providing jobs) the same thing that Days for Girls produces here. The need for these products is that girls in developing countries are often ostracized during their menstrual periods and lose so much school time over their teenage years that they never get a good education. Thus they struggle to learn the skills to apply their raw talent to the benefit of society. The founder of the worldwide charity Days for Girls, Celeste Mergens, will make a presentation at our event about the importance of helping every girl remain in school, even during “that time” of the month. Celeste has just visited Side by Side’s Game-Changer project in South Africa and will describe her experiences. Once you meet her, you will be changed. Her passion for helping girls around the world is contagious! Tickets $35, 5:30 to 9pm. Please contact Brenda Wall to buy tickets, to help sponsor the event, and for other questions.